We’re human. We face fear all the time. It’s what we do with that fear that either propels us forward or plummets us backward. The ultimate goal is working past fear and toward acceptance. What primary fear are you facing today? Is it fear of your unstable new business walking its way into the garbage? Is it fear of growing old alone? Is it fear of a relationship being in danger of ending? Is it fear of a new venture turning sour? Is it fear of not having enough resources to pay your bills and rent/house payment? Is it fear of becoming successful beyond your wildest dreams and not being capable of handling your success emotionally and intellectually? No matter where we are in our lives today, we’ve all experienced the scourge of fear, most likely more than a few times. But let’s dissect fear for a second. Fear can paralyze you into inaction. Fear can stop your destiny in its tracks. Fear causes people at 80 years old to sit frozen in regret and say, “Woulda, Coulda, Shoulda.” We’ve all been told that 85% of our fear is imagined and never comes to pass. It’s the thought of fear that occupies our minds like enemy territory and trumps our energy. Healthy fear initiates action. Fear means you are working, toiling, and accomplishing something. Unhealthy fear promotes coiling back in frozen surrender. Let’s break up with unhealthy fear. Let’s tell fear that its no longer allowed on our real estate. Let’s tell fear that we want our hopes and dreams back. Let’s tell fear that our heart refuses to be its home. Let’s tell fear that we’re no longer its prisoner. Keep working on that project, even if the completion seems light years away. Keep working on that relationship to make it strong and intimate. Keep working on your business so it grows like a mighty oak tree. Keep working on your finances by educating yourself and creating a plan to prosper. Keep working on your emotional intelligence level so you can easily handle success that will surely find you. The opposite of fear is acceptance. 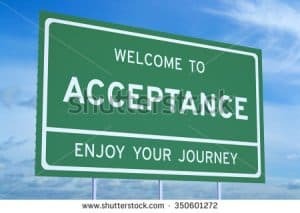 Acceptance of a current reality, and acceptance of what might happen in the future. We need to embrace that we live in a fallen world and we’ll all experience a mixture of good and bad. No amount of fear will change that mix. 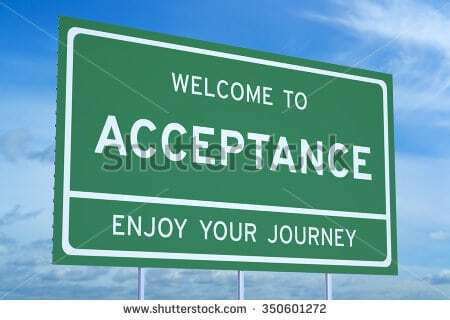 Acceptance develops our internal strength and resolve to tackle any situation with our head held high. Very good article. I love the photo of the Angel Oak tree from South Carolina. I grew up not far from that tree. Education can often help you overcome unhealthy fear. As for healthy fear, well, I guess you’ve just gotta jump in and do it anyway. That kind of fear is often a way to stop you from saying “oops.” Great article.